I could watch the city life only through windows of a bullteproof car. 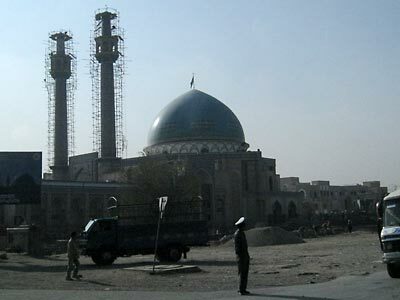 There are not many mosques in Kabul. This new mosque is built by Iran and about to be completed. I recently paid a short visit to Kabul. 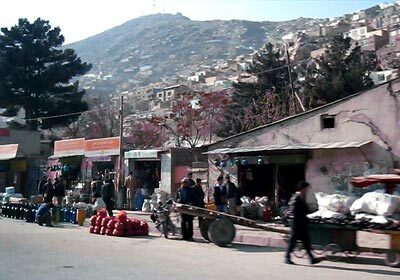 It is said that the security situation in Afghanistan has been deteriorating since last year. Therefore I was a bit nervous when I was approaching Kabul by a jet from Delhi. Seen from the height of the sky, the landscape of Afghanistan was colored brown and there was no green anywhere. Though the weather was completely fine, the color of the sky near the horizon appeared dull brown due to tiny floating particles of sand. Despite a not very promising beginning, the life on the ground was a pleasant surprise. 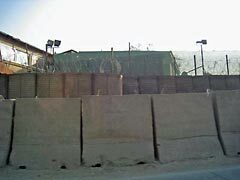 All foreign establishments are guarded by high barricades. Before I went to Kabul, I had read an UN report. It stated that the overall security situation continued to deteriorate since the beginning of 2008. Until the end of August 1,445 civilian casualties were recorded and this figure represented an increase of 39% over the same period of 2007. In particular, the recorded casualties for July and August were by far the worst since 2001. Therefore, I thought that the situation in Kabul might be as bad as Sarajevo in February 1994, when I visited the destroyed city and was forced to stay overnight in the half demolished "Holiday Inn Sarajevo", as the runway was bombed and no airplane could take off. I remember the night very clearly when I could enjoy good Yugoslavian wine from the hotel's wine cellar together with other hotel guests, while tracers were flying and lighting up outside followed by loud bangs. The Kabul airport looked very quiet and idyllic and a new terminal building was glittering under the sunshine. On the way to the city center, I could see many people strolling and shopping. There were many shops on both sides of streets and they were filled up with all kinds of goods. New apartment houses were mushrooming. People looked very happy and confident. This was a surprise. So far as I could feel, there was no tense atmosphere. But, my feeling was not deceived. Later, I was told that the security situation in Kabul had recently improved and the number of incidents in Kabul decreased this year, due to the strengthening of the Afghan police and military in the capital. Taliban changed its strategy last year and it now attacks easier targets and uses hit and run tactics. This resulted in the increase of casualties in provincial areas, in particular, in the volatile Eastern and Southern regions. But, it does not mean that the overall situation has changed to the advantage of Taliban. The Afghan government has been gradually strengthening its governance instead. Afghanistan has an old and glorious history. Many Japanese people know the huge Buddha statute in Bamyan - which was unfortunately destroyed by Taliban - as well as the expedition of Alexander the Great into Afghanistan. Afghanistan's lapis lazuli was already imported into Japan in ancient time. On the other hand, its complicated ethnic and social formation and difficult geographical condition make it difficult for Afghanistan to realize a functional national state. Needless to say Afghanistan has had a very difficult time since it was discovered by Western colonial powers. 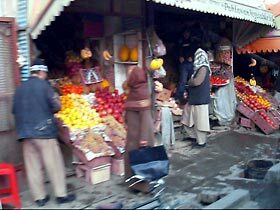 Afghan people have not succeeded yet to overcome the difficulty. 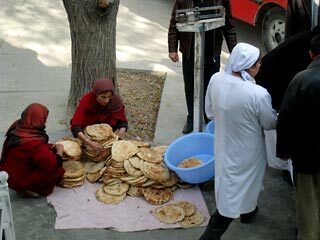 Distributing nan for lunch in a courtyard of a hospital. 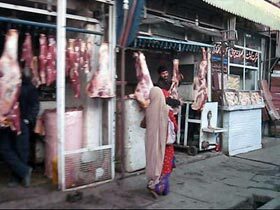 This time, I saw many women in the streets of Kabul. They wore different cloths, varying from burqa to Western style cloths and many women did not cover their face. I find it fine, that they can choose what they want to put on, though I respect their Islamic and Afghan tradition. It is not simple for developing countries to catch up with the advanced countries, while keeping their identity. Japan is said to be a successful example of harmonious development of modernization and tradition. But, even Japan has lost a lot of its tradition and it is still losing many precious cultural and spiritual heritages. Afghanistan has the right to find its own solution while keeping its precious traditional value. However, we should not return to the old feudal value system. We are in the 21st century. Even the strongest traditionalists should understand this, I believe. When Japan started to catch up with the Western world, the gap was not so big. Compared to Japan, Afghanistan must overcome much harder obstacles. Through my short stay in Kabul, I became convinced that Afghanistan is on the right track to a prosperous and peaceful future. I hope that Afghanistan will solve its difficult problems in the near future. This time I was advised not to go out of the car, as it was too risky to go around in markets or city districts. I hope, I can move freely, when I visit Kabul next time.